Our memories are constructed, but no one person can choose how; and our memories are not simply retrieved, and yet neither are they free flotating, entirely manipulable to present interests. The second … is that failure to remember can impose unacceptable costs. Martha Minow, in Phi Beta Kappa Oration at Harvard, June 8 (Harvard Magazine, July-August 1999, p. 64) Minow is a Harvard law professor. We are what we remember. This photo on the front page of Monday’s New York Times provokes three questions:How could the Serbs have been so stupid?How could NATO be so stupid?How can we keep from being so stupid ourselves?The collective stupidity of intelligent individuals is the great conundrum of our, the human, race. Serbs, not all Serbs certainly but a critical mass at critical moments, have allowed themselves to be bamboozled by a tiny clique of opportunist politicians to pursue a horribly self-destructive campaign that has ruined their economy, made refugees of great numbers of their people and now, finally, lost what their own myths proclaimed as their most sacred territory, symbol of their national aspirations. The stupidity of NATO included alienating China, trying to outfox Russia (the agreement with Russia that ended the war said explicitly that the occupation would be under UN, not NATO, command), and ignoring the protests over the bombing campaign from its own members, especially Germany and Italy. Bombing markets, hospitals, TV stations and commuter trains in Serbia wasn’t all that bright, either. Only the bombs were smart, not the people or policies that directed them. No matter what the insufferable, smirking Shea may think (if he thinks), we are not going to achieve a unipolar world led by the US and seconded by Britain, where compromise is unnecessary. Even the power of NATO will meet, and already has met, certain immovable objects. As for the last question, well, we just have to remain alert, and skeptical. Stephen Dusan, or Stephen Uros IV, b. 1308, d. Dec. 20, 1355, who reigned (1331-55) as king of Serbia after deposing his father, Stephen Uros III (r. 1322-31), brought Serbia to its height of power through his conquests. He seized part of western Macedonia from the Byzantine Empire in 1334 and in 1343 conquered Albania and more of Macedonia. 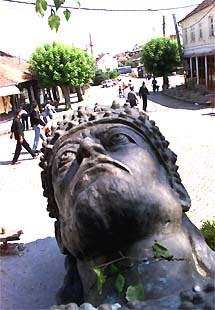 Stephen had himself crowned emperor of the Serbs and Greeks in 1346. He captured (1348) Epirus and Thessaly and promulgated (1349, 1354) a law code. His empire collapsed, however, under his son and successor, Stephen Uros V (1355-71).From Grolier Multimedia Encyclopedia. ©1998 Grolier Interactive Inc. All Rights Reserved. “The Matrix” is also connected to another, related theme in world culture, the power of belief to conquer mere matter. The hero is able to defeat the “agents” only after he achieves absolute faith in the irreality of the weapons they use against him. At that moment, he is able to hold up his hand and make the bullets stop and drop to the ground, and to do many other extraordinary things. The Sioux warriors of the Ghost Dance religion believed they could do that, and so have many warriors in Africa and Asia, when they had only their spirits to defend them against superior (material) weaponry. Oddly, though, the belief also pops up in settled, unthreatened, technologically advanced societies; when the material world is not what people wish it to be, some of them strive to believe that thinking alone can change it. As the “Scientific Statement of Being” of Christian Science (written by a Bostonian lady, Mary Baker Eddy, in the 1880s) puts it, “There is no life, intelligence nor substance in matter; all is infinite Mind and its infinite manifestation, for God is all in all. Spirit is immortal truth, matter is mortal error. Spirit is God, and man is His image and likeness. Therefore man is not material, he is spiritual.” The material world is just an illusory matrix. When societies aren’t organized so that the old vested interests can be brushed aside, entrepreneurs cannot emerge. Social systems have to be built in which entrepreneurs have the freedom to destroy the old. Yet destroying the old can too easily be seen as a step into chaos. Societies that aren’t ready to break with the past aren’t willing to let entrepreneurs come into existence. Thurow obliquely supports a thought I have long held, as to why the industrial revolution began in England and Scotland and not in Asia, or central Africa, or Mexico or the Andean highlands, or even England’s European neighbors Holland, France or Spain — and consequently why England’s colonies in the Americas had such a headstart, economically, on the parts colonized by Spain, Portugal or France. The main problem, I believe, was that the rulers of these other places were too good at doing what rulers always try to do, which is to suppress innovations that threaten the social order. The Spanish monarchy was especially efficient at this, through a cultural stabilization program called the “Inquisition.” The British monarchy, in contrast, had been so shaken by civil wars and regicide (1640) that it had lost control of the economy, and couldn’t stop a James Watt or anybody else who thought up a new industrial process. My apologies to my webpage visitors — who, to judge from the hit counter below*, exist entirely in my imagination. Still, I have always felt affection for the creatures of my imagination, and I do not wish to disappoint you. I have let too many weeks go by without a new “thought” — not because I had suspended thinking (oh, if only I could!) but because I had lost connection to the server. Now this page resides on a different server. A strange thing has happened to me lately. Everybody looks like a Serb. Even people on the subway who, because of their skin colors, almost certainly are not Serbs. I think it has to do with the realization that there is no possible useful distinction between “guilty” and “innocent.” I know it’s a hallucination — similar to the one suffered by many where everybody with a gun and a sneer looks like a German Nazi, and everybody persecuted looks like a Jew, except that in my version, there is only one category. I am very disturbed by all of it — the Serb paramilitary black-jackets (whom, I strongly suspect, are not at all controllable by Milosevic), the KLA hotheads who had more or less deliberately provoked retaliation by murdering both Serbs (starting with policemen) and even Albanian Kosovar “collaborators,” Milosevic’s thuggery against the opposition journalists & politicians, the burnings of villages, the bombings of Belgrade and Novi Sad, the killing by NATO “friendly fire” of refugees, and on an on. So I’m struggling to define how I can best intervene, make some effort to help redeem the dignity of our human race. It will have to be by writing; that’s the only way I know to fight. And it will have to be to make at least some more human beings stop to think, instead of letting smart bombs be our only smarts. For instance: do cultures actually exist as separate, pure, defensible entitities? Is not mélange, adulteration, impurity, pick’n’mix at the heart of the idea of the modern, and hasn’t it been that way for most of this all-shook-up century? Doesn’t the idea of pure cultures, in urgent need of being kept free from alien contamination, lead us inexorably toward apartheid, toward ethnic cleansing, toward the gas chamber? I knew the punchline — “Yogurt has a culture” (har, har) — and didn’t want to hear it, so I just told him it was a stupid joke. What I wish I’d said, and may yet say if the opportunity recurs, is that America has many cultures, whereas yogurt has only one. Or maybe I should say, no illegal aliens by the hundreds of thousands are trying to smuggle themselves into yogurt– but I like the “many cultures” response better. p. 15, Thomas Pynchon, Mason & Dixon. New York: Henry Holt and Company, 1997. It’s 1761, and 28-year old Jeremiah Dixon has come to London for the first time to meet Charles Mason, 5 years older and more experienced in the ways of the great city. I’ll bet Dixon would get a thrill from riding the No. 4 subway with me, between Manhattan and the Bronx, some morning or evening. This is the best line in what is otherwise a gushing ode to the U.S. president with the most public privates in history. As a journalist, GGM is a great entertainer — “Escribo para que mis amigos me quieran más” (“I write so that my friends will love me more”), he’s said many times, and because of that intention, his ideas are nicely formed but lack critical depth. And I suspect that fiction — deliberate invention of stories — is really even older than Jonas. Trotsky said once — probably he said it many times, because it’s too good an idea not to repeat — that the question wasn’t whether the ends justify the means. Of course they do! What else could possibly justify them? The problem was to justify one’s ends. p. 8 of Douglas Coupland, Generation X: Tales for an Accelerated Culture. New York: St. Martin’s Press, 1991. W. H. Auden, from “In Memory of W. B. Yeats” (February 1939; Yeats had died the previous month. )This stanza, which I first heard intoned in Audens’ deep, hoarse voice, recording date unknown, was not included in his final version in Collected Poems. Still, even if Auden himself came to have doubts, I treasure these lines, and want to believe that they are true. Well, there you are. You care about the punctuation or you don’t, and Hemingway did. You care about the “ands” and the “buts” or you don’t, and Hemingway did. You think something is in shape to be published or you don’t, and Hemingway didn’t. Joan Didion, “Last Words (Those Hemingway wrote, and those he didn’t)”. The New Yorker, Nov. 9, 1998, p. 78, commenting on his heirs’ “cleaning up” and publishing some of Papa’s typescripts. Gabriel García Márquez’s comment on the trials of Bill Clinton, in an editorial in his new magazine Cambio, Jan. 25, 1999. William Wheaton is an astronomer at the California Institute of Technology. He is also a contributor to the wonderful, zany science information page “Mad Scientist.” For more of the thoughts of Bill Wheaton, check out his web page.